Who else gets inspired by great outfit ideas on Pinterest? Who else gets disappointed knowing that those great skinny pieces all laid out on the white background will never look that great on your curvy body? Stinks - right? But there's hope. 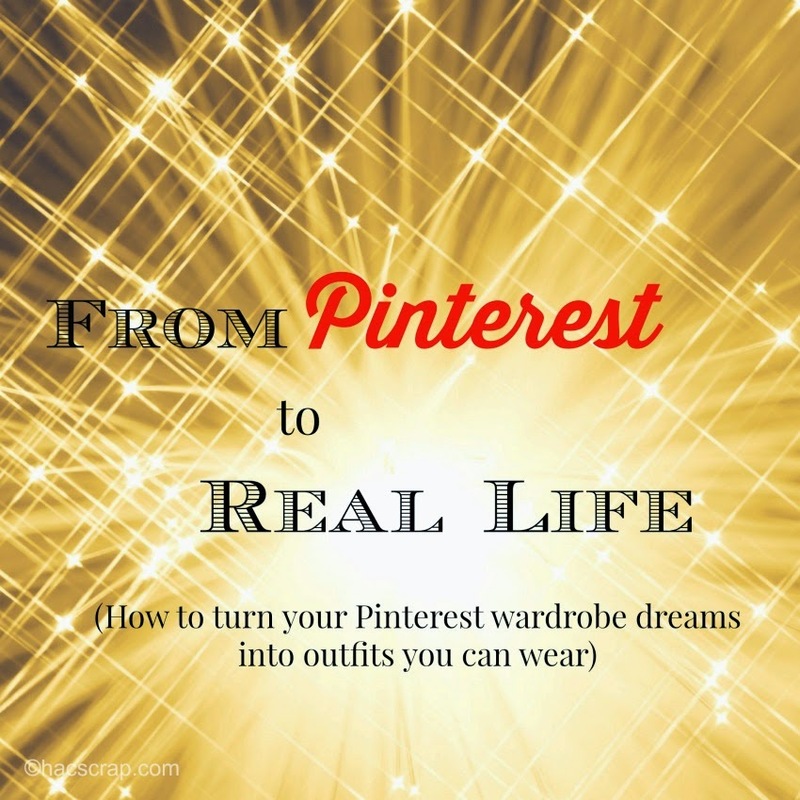 Use the inspiration you find on Pinterest to create your own looks. Say what, you may be asking. . .take a Pinterest look you love and take a long hard look at it. What about it do you love? Is it the color palette? Is it the accessories? Once you identify the main thing drawing you in, think about what you own that is similar. Need something? Add it to your shopping list for next time you're kicking up your wardrobe or there's a great sale at your favorite store. Don't get me wrong, I love to shop and I wish I had the budget to recreate all those great Pinterest looks. But my reality is that I have to do the best I can with what I have, and be smart about adding new pieces to my wardrobe. Then I can indulge in the occasional splurge and spoiling of myself. So I wanted to share how I put these tips into action for myself. 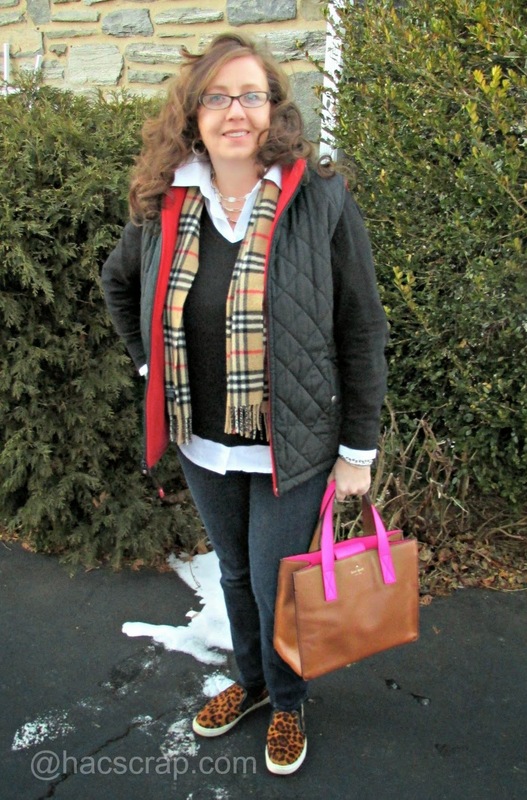 Here's a link to a Pinterest outfit I've loved for a while now. Not bad right? My outfit choices are little more casual than the Pinterest outfit, but I was going bowling and running errands, so they worked. 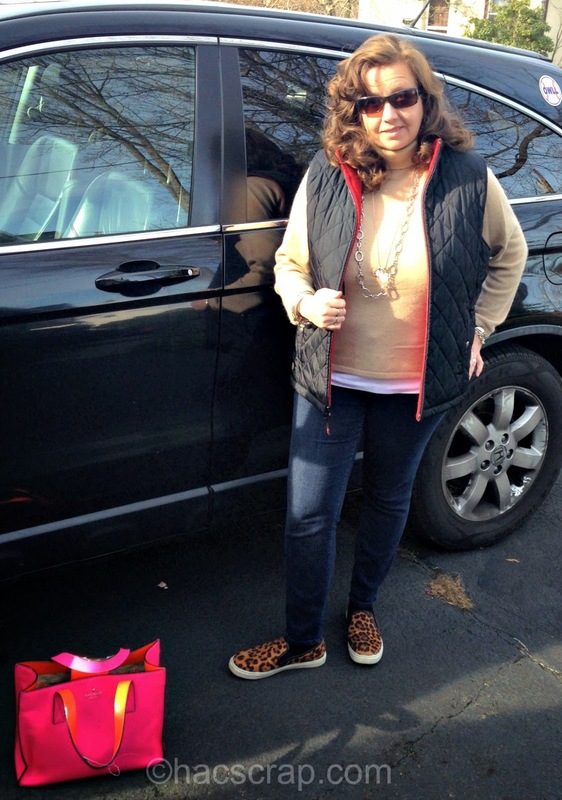 Also, I am adding a camel cashmere crewneck and leopard flats to my style wants list. Both should be on sale right about now or soon. How do you re-create looks you love? Love it! The camel sweater is actually one color I don't have in my closet yet I always seem to need. I've been collecting leather pant outfits in my Pinterest board.. just need the coordinating tops to go with. Oooh fun. I have just started imitating outfits from a blogger I follow. I find I feel a little better about myself when I think I look different than my normal jeans and black tee. Found you from the link up. Your Pinterest outfit looks great - love the animal print shoes! Super chic! I love the BAG especially! And the vest is really cute, too. In the second one I almost thought you added a jacket that was like the vest. Great job at creating your outfits.